My plan for my Malabrigo was a simple cardigan with leg ‘o mutton sleeves. I roughed up a quick pattern and started with the "sleeve as swatch" procedure. Here’s the sleeve and I don’t like it. I’d feared that the fabric I got from Malabrigo would be too heavy to make a fun poufy sleeve. I was right. It’s not really working for me. I’ll have to return to the drawingboard. Now I’m thinking a plain top down stockinette cardi. 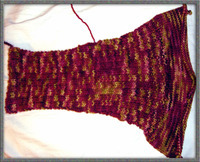 This variegated yarn is too busy for much stitch detail, so stockinette is the obvious choice. Maybe I’ll make a modified saddle shoulder in the round from Knitting Without Tears and cut the front to make a caridgan. Those sideways saddles and back yoke would look fab knit in a different direction. Hmmm, I’ve got some ripping to do tonight. I also came across a mention of Debbie Bliss’ pattern book Out of Town on Stephanie’s blog. I innocently clicked and liked just about every pattern in the book. I picked it up on someone’s ebay store just like that. So click with caution people.